In his Epistles, Horace discusses, in a series of verse letters addressed to friends, philosophy, virtuous and independent living, social behavior, and being a poet. This third in a series of essays on Roman poet Horace looks at his verse epistles. Most readers are probably at least slightly familiar with the form in either verse or prose: Martin Luther King’s “Letter from the Birmingham Jail” is a famous prose example; Alexander Pope’s “Epistle to Dr. Arbuthnot” is usually considered the finest example in verse written in English. In both cases the aim is identical – the writer seeks to offer explanation, defense, justification for him (or her)self and for his/her beliefs, practices, or, as in the cases of both Horace and Pope, poetry style choices. 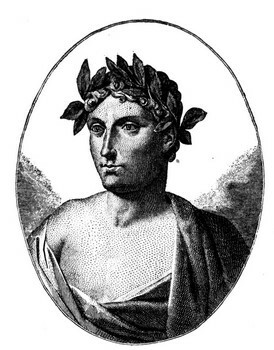 Horace’s Epistles have some of the gentle sting of his Satires, but there is an ease in these works that one doesn’t find in those previously discussed poems. This is Horace writing to friends for one reasoin earlier essaysn or another on one occasion or another, opening up about his work, his health, his pleasures, his annoyances, his hopes, his fears. There’s a freedom to the poet’s writing here that both intrigues and enlightens the thoughtful reader and gives us insight into Horace the man that neither the Satires, aimed as they are at allowing the poet to show off his mastery of analysis and commentary, nor the Odes, meant as they are to be “public” works demonstrating poetic skill and mastery of craft, allow. These works, while equally as skilled as those mentioned above, are the poetic equivalent of good conversation over drinks between friends. There are two books of Epistles, as there were two books of Satires. As with the Satires, the first book of Epistles is considerably longer than the second. One more matter should be mentioned. As I have noted in earlier essays, I am reading Horace in the “literal prose translation” of Christopher Smart from the 1750’s. Smart, as translators before and since have done, separates Horace’s “Ars Poetica” from the second book of the Epistles, though it rightfully belongs there and was placed so by the poet. The tradition of separating Epistle III from its brethren in Book II of the Epistles began sometime about the time of the Renaissance and gained impetus in the eighteenth century as literary criticism as we know it (or used to know it, given that pretty much all art criticism has disappeared down the rabbit hole of pop culture studies now) first reared its self-important, condescending head. “Ars Poetica,” along with other classical works such as “On the Sublime” by Longinus found their way into compilations of “the history of litcrit” along with works such as Sidney’s “Defense of Poesy,” Johnson’s critical observations in his Lives of the Poets and Preface to Shakespeare, and Shelley’s “A Defence of Poetry.” So we shall treat “Ars Poetica” as it has been treated traditionally and discuss it in one final essay on The Works of Horace. [Wine] discloses secrets; commands our hopes to be ratified; pushes the dastard on to the fight; removes the pressure from troubled minds; teaches the arts. Whom have not plentiful cups made eloquent? Whom have they not made free and easy under pinching poverty? Live: be happy. If you know of anything preferable to these maxims, candidly communicate it: if not, with me make use of them. It is a truth, that everyone ought to measure himself by his own proper foot and standard. The stag, superior in fight, drove the horse from the common pasture, till the latter, worsted in the long contest, implored the aid of man and received the bridle but after he had parted an exulting conqueror from his enemy, he could not shake the rider from his back nor the bit from his mouth. So he who, afraid of poverty, forfeits his liberty, more valuable than mines, avaricious wretch shall carry a master, and shall eternally be a slave, for not knowing how to use a little. For he who will be covetous, will also be anxious: but he that lives in a state of anxiety will never, in my estimation, be free. He who is always in a hurry, and immersed in the augmenting of his fortune, has lost the arms, and deserted the post of virtue. The melancholy hate the merry, and the jocose the melancholy; the volatile dislike the sedate, the indolent the stirring and vivacious…. In every thing you must read and consult the learned, by what means you may be able to pass your life in an agreeable manner that insatiable desire may not agitate and torment you, nor the fear and hope of things that are but of little account: whether learning acquires virtue, or nature bestows it? What lessens cares, what may endear you to yourself? What perfectly renders the temper calm; honor or enticing lucre or a secret passage and the path of an unnoticed life? The inconstant people have changed their mind, and glow with a universal ardor for learning: young men and grave fathers sup crowned with leaves and dictate poetry. I myself, who affirm that I write no verses, am found more false than the Parthians…physicians undertake what belongs to physicians; mechanics handle tools; but we, unlearned and learned, write poems. The problem, as Horace sees it, is that too many people who think they’re writers aren’t. Luckily, we don’t face the same difficulty. Today, as we all know, everyone who thinks he/she is a writer is. Given the problem he perceived, Horace wrote “Ars Poetica” to help those who aspired to be poets understand what they needed to do to be poets. Maybe someone, some guru (I nominate that life expert Mark Zuckerberg) needs to tell us which books are good and which are not. Oh, wait. He’s already doing that.